1) "Listening to the radio for the first time", 70X90, tempera on cardboard. 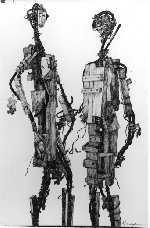 Exhibited on a retrospective exhibition, Barbican center, London 1992'. 2) "Chinese crafts", 90X100, tempera on canvas. 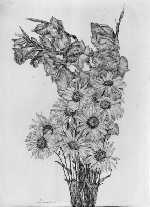 Exhibited in Mane-Katz museum, Heifa, 1995. 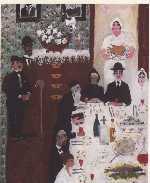 3) "Long life to the young couple", 70X90, tempera on canvas, Exhibited in the Israel Museum, Jerusalem, 1979. University of Heifa, Art Gallery, 1980. Mishkan le-Omanut, Ein-Harod Kibbutz, 1982. Barbican center, London, 1992. 4) "My uncle Shalom", 90X100, tempera on canvas. 5) "The row of eggs", 90X100, tempera on canvas, University of Heifa, 1980. Barbican center, 1992. Gregory Gallery, N.Y., N.Y., 1998.
canvas, Ein-Harod, 1982. Barbican enter, 1992. 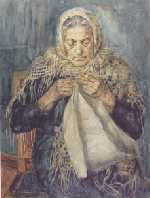 1) "Mama knitting", 1949, 60X69, watercolor on paper. 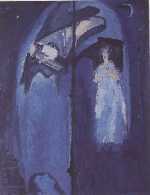 2) "Mama's sick", 1968, 80X64, tempera on cardboard, Both exhibited In Jerusalem Artists House, 1982. Barbican Center, 1992. 80X70, Ink on paper. 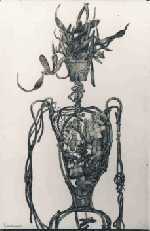 Exhibited in Kibbutz Ein-Harod Museum, 1982. Barbican Center, 1992. Kibbutz Bar-Am Museum, 1995. 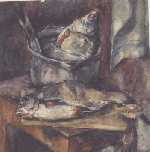 1) "Still life with fish", 1947, 50X53, watercolor on paper. 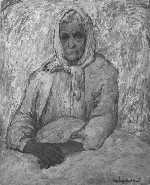 Exhibited in The Barbican Center, 1992. Kibbutz Bar-Am Museum, 1995. 2) "In the Kuskoro Park", (1976), Moscow. 90X100, tempera on canvas. Exhibited in The Barbicam Center, 1992. 92X63, Ink on paper. 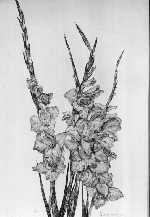 Exhibited at the Jerusalem Artists House, 1982. Shulamit Gallery, Tel-Aviv, 1993. Barbican Center, 1992. Kibbutz Bar-Am, 1995. Gregory Gallery, 1997.